Britain had been cautious after supposed chemical attacked of ex-spy Russian agent happened in Salisbury. May ranted over Putin's trademark weapon penetrating inside the premise but Russia denied the claimed of London. As the supposed cyber war attacks of Russia in any parts of the world. UK arrived a swear to retaliate the provocation of Russia to counter the cyber weapon to protect the country from grieved violations. Intelligence reported that Russia's Kompromat will take on to compromise the Members of Parliamentary or any prominent individuals inside EU. "Our critical infrastructure gets hit frequently by Russia and it is not always clear for what purpose. 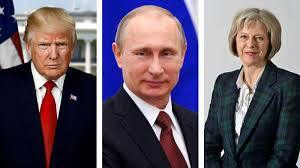 As a government as a whole we want to counter hostile Russian intent towards the democratic system and we have got all sorts of different parts of government working on that," UK said. In lieu, UK, US and France take on to attack Syria, as Russia had backed up the Syrian government to fight militants to destabilized the Syrian government.